Hearty Southern breakfast spreads are back and better than ever. In the South, the morning meal is a celebration. It’s a time to gather at the dawn of the new day, enjoying great company, honoring tradition and indulging in favorite foods. Take eggs, for example. Whether they are fried, scrambled or folded neatly into an omelet, incredible, edible eggs are perhaps the MVPs of a classic Southern breakfast. Next to eggs, we savor warm creamy stone-ground grits, lightly salted and topped with a pat of melting butter. We give special thanks for wavy strips of crispy bacon, still sizzling from the pan, and the joy of inhaling the steam wafting from the inner fluff of buttermilk biscuits. Add a glass of freshly squeezed orange juice and a cup of strong coffee, and it’s hard to imagine a better way to start the day. 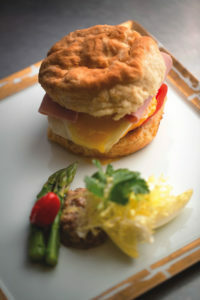 Throughout the 20th century, however, the South saw a change in its common breakfast fare. Busier, less active lifestyles caused many to abandon traditional morning meals in favor of smaller, faster-to-prepare items like cereal, breakfast bars, portable containers of yogurt and drive-thru breakfast sandwiches. In recent years, the tide has shifted once more. A 2013 “What America Eats” survey that was conducted by Parade magazine and sheknows.com concluded that the majority of us still prefer a more substantial breakfast, such as a plate of scrambled eggs, bacon, hash browns and toast. The study also revealed that even though our lives are busier than ever, 77 percent of us still eat breakfast at home. According to a 2016 report from global information company NPD Group, increasing numbers of consumers, particularly young adults, are turning to more-involved morning meals at home, such as eggs and other “traditional” breakfast foods. NPD Group also predicts the consumption of breakfasts and morning snacks to increase 5 percent through 2019. 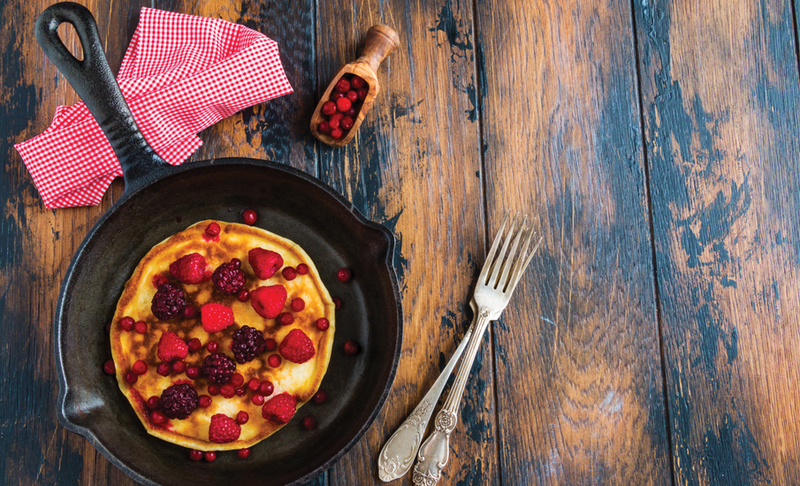 It seems that the breakfast renaissance is in full swing, and the South is as well-known for its big breakfasts as it is for its hospitality and sweet tea. Dozens of theories emerged pertaining to the cause and cure for indigestion. “Three Squares” describes an 1898 parenting manual which lambasted pancakes, saying that they were “one of the worst things that a child can put in its stomach.” Meat also came under attack, and many food evangelists advocated for meatless breakfasts. By the turn of the 20th century, lighter, faster fare had become a weekday mainstay in cities, with weekends (especially Sundays) reserved for larger, old-fashioned spreads. However, big breakfasts never lost their popularity in more rural, agricultural settings in the South, with mixes like Jiffy and Bisquick making prep easier. Perhaps nostalgia has brought about the revival of traditional breakfast spreads, or perhaps it’s the recent pushback on processed foods. Or maybe it’s simply because we love the indulgent comfort that sitting down with family and eating traditional breakfast foods adds to our lives. There is also research to suggest that consuming a substantial breakfast can have health benefits. For example, a 2014 study published in the journal Diabetologia found that bigger breakfasts and smaller dinners helped produce lower blood sugar levels in Type 2 diabetics. A 2013 study conducted by researchers at Tel Aviv University showed a correlation in eating a larger breakfast and weight loss among overweight women. Over 12 weeks, two groups of obese and overweight women were put on a strict, 1,400-calorie-a-day diet that consisted of mostly healthy food selections. The results found that the group that ate the large breakfast and small dinner lost nearly 2.5 times as much weight as the other group. A study published in Frontiers in Human Neuroscience in 2013 found that adolescents who ate breakfast daily had a lower body mass index than teens who never or seldom ate it, and the breakfast eaters consumed more calories, fiber, and cholesterol in their overall diets compared to those who skipped it. Fehlenberg suggests limiting fats and high-calorie, refined foods. She encourages clients to focus on whole grains, like bowls of rich, nutritious oatmeal. However, she warns that instant, single-serve oats often have an inordinate amount of added sugar. Plain oats can be sweetened by mixing in some fruit or drizzling honey or maple syrup on top. Sprinkle a few nuts on top as well to add protein. “Choose healthy carbohydrates and proteins and make sure your choices contain fiber, because protein and fiber will help you feel satisfied and less hungry for a longer period of time,” she says. As for eggs, Fehlenberg says eating them for breakfast is fine, in moderation. “Eggs are a great, all-natural source of high-quality protein,” she notes. At Sea Island, breakfast isn’t just a meal—it’s an event. “I think that breakfast is quite special; a time to sit down and enjoy one another,” says Julian Scheibel, chef de cuisine at the Forbes Five-Star Georgian Room at Sea Island. “We make sure that our guests start their day with a great experience.” There is no shortage of options for those in the mood for a big Southern breakfast. Traditional favorites are offered along with new, creative interpretations. 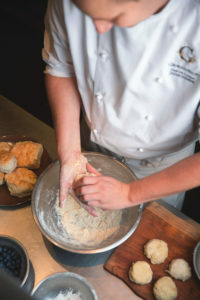 “Our buttermilk biscuits and gravy are extremely popular, as are our omelet, and our thick, creamy grits topped with cheese, bacon and scallions,” he says. “And we offer an interesting cathead biscuit sandwich with eggs, American cheese, and Broadfield ham. Our guests devour them.” (Cathead biscuits are so named because each is as big as a cat’s head.) Scheibel notes that his Southern-inspired red velvet pancakes with cream cheese icing are also a guest favorite. While dessert for breakfast might be an occasional indulgence, it isn’t difficult to recreate a traditional, savory, Southern morning feast at home on a more regular basis. Scheibel suggests using eggs as the cornerstone of the meal. “A beautiful omelet doesn’t take much effort—eight minutes from start to finish,” he says. “And scrambled eggs are easy, too.” You’ll also want a platter presenting bacon, ham or sausage patties. Cooking grits can be a bit tricky, but worth the effort. Once you can make a perfect pot of grits, you can focus on topping them with delicious extras like butter, cheese, scallions, bacon, ham bits and crumbled sausage. Another Southern staple, buttermilk biscuits take practice to master, but your family will thank you. Serve them warm from the oven, allowing a pat of butter to melt inside, and add a dollop of fruit preserves, apple butter, or amber honey for a touch of sweetness. If biscuits are too difficult, toast or pancakes are also delicious alternatives. The face of breakfast, and the way we prepare it, has evolved through the years to keep pace with changing lifestyles, but the South continues to share its tradition of big, hearty morning meals. Preheat oven to 350 F. In a large mixing bowl, combine the dry ingredients. Add butter and work into dry ingredients until butter is walnut-sized. Pour in buttermilk and mix just until incorporated. Roll out to about half-inch thickness and allow the dough to relax. Use a round cutter or thin-rimmed glass to cut rounds 3-4 inches in diameter. On a baking sheet that has been lined with parchment and then buttered, arrange the dough rounds and bake until golden brown.